1 Cloudbusting. 3 Sat In Your Lap. 2 The Man With The Child In His Eyes. Bush also looks to eclectic sources for inspiration. "The Dreaming" was inspired by Rolf Harris's "Sun Arise" and the Aboriginal song "Aeroplanes" "Hounds of Love" took its inspiration from the film "Night of the Demon.". EMI Label - CDP 7 46164 2 - Made in UK - -. Kate Bush- Hounds Of Love - CD -. CD, CASE & BOOKLET IN VERY GOOD CONDITION. .
Picture cd and cover in very good condition. Plays perfect. Great condition - just a couple of light scratches / cleaning marks. limited edition cd single. The Best Of EMI 1989-1990 Rare double CD. The discs and booklet are in mint condition. Kate Bush 'Aerial' Gatefold CD. 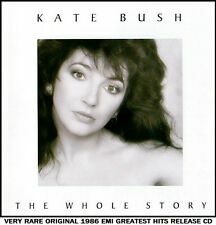 KATE BUSH, THE WHOLE STORY, CD ALBUM, TOUGH TO FIND. KATE BUSH. THE WHOLE STORY. Original disc, sleeves & case. ORIGINAL CD IN EXCELLENT CONDITION. 522EM / 2305. Kate Bush - The Red Shoes. This Cd has been used it has been quality checked and is like new. The Red Shoes. Sold By Cd Junction. Top Of The City. Eat The Music. The Song Of Solomon. Kate Bush - Hounds of Love. Title:Kate Bush - Hounds of Love. Artist:Kate Bush. All of our paper waste is recycled within the UK and turned into corrugated cardboard. Your item will be previously owned but still in great condition. Rubberband girl. Rubberband girl (extended). 7 Running Up That Hill 5:00. 3 The Man With The Child In His Eyes 2:38. 11 The Dreaming 4:14. 9 Sat In Your Lap 3:29. 2 Cloudbusting 5:09. 7 Running Up That Hill 5:00. 3 The Man With The Child In His Eyes 2:38. EXCELLENT CONDITION - just the odd light surface mark. 11 The Dreaming 4:14. 9 Sat In Your Lap 3:29. 2 Cloudbusting 5:09. The Red Shoes. UK £0.00, extra copies add £0 per item. UK Parcel Force 48 hour £9.50, extra copies add £9.50 per item. Top Of The City. We have offices near London in the UK, Las Vegas in the USA, Hiroshima in Japan. Kate Bush - aerial - 2 cd set in gatefold card case and booklet. - emi Records 2005 eu. RUBBERBAND GIRL. Rubberband Girl. (Extended Mix). Condition: Ex, marking to CD & Insert, New case. Cat Number:CDEM 280. Picture CD. Kate Bush - The Whole Story. Running Up That Hill. Grading Guide. The Man With The Child In His Eyes. The Dreaming. Excellent - Overall in excellent condition but may have very slight signs of wear including lug indentations. EMI 077774641425 1986 CD and case are in excellent condition. Running Up That Hill. - THE WHOLE STORY -. Disc, case, cover art and liner notes - Excellent condition. The Man With The Child In His Eyes. Wuthering Heights (New Vocal). The Dreaming. Hounds Of Love. Artist: KATE BUSH. Title: AERIAL. Label: EMI. Format: DOUBLE CD. Kate Bush CD - The Red Shoes. KATE BUSH Hounds Of Love 1997 Remastered with bonus tracks Vgd cond used CD. Condition is Very Good. NO cracks or fractures to the cd case. the artwork and the disc are in near mint condition. Dispatched with Royal Mail 2nd Class Large Letter. 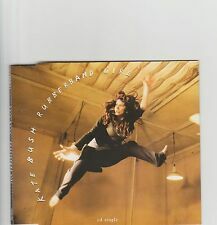 Kate Bush - Aerial [Digipak] (2CD) 24HR POST!! 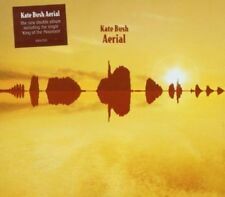 4.5 out of 5 stars - Kate Bush - Aerial [Digipak] (2CD) 24HR POST!! 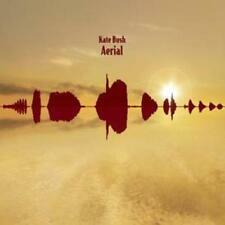 53 product ratings53 product ratings - Kate Bush - Aerial [Digipak] (2CD) 24HR POST!! KATE BUSH - THE RED SHOES CD. DISC & CASE IN VERY GOOD USED CONDITION. The Kate Bush " The Kick Inside" debut. " The Kick Inside". Reissue Cd. This is the cd reissue of. This cd is manufactured in holland. It contains thirteen excellent. by Imsgroup(Matrix : 7460122). Here is a great chance to obtain an original 1989 CD release of Kate Bush's The Sensual World album. The Cd booklet is in a good clean condition and the CD plays fine. Rare Cdr promo from japan. Kate Bush - The Whole Story CD. In excellent condition. Case Mint As New, inlay excellent and disc has a couple of tiny light marks that do not affect play. Kate Bush - Aerial. Aerial Tal. CD One - A Sea Of Honey. CD Two - A Sky Of Honey. A Coral Room. King Of The Mountain. Includes A 24 Page Booklet/Insert With Lyrics & Photos. Excellent - Overall in excellent condition but may have very slight signs of wear including lug indentations.